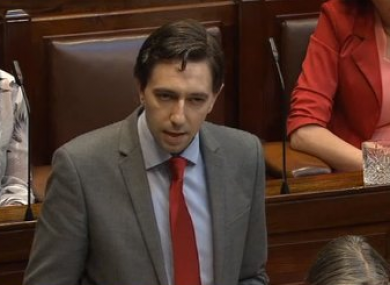 THE HEALTH MINISTER Simon Harris has apologised to Amanda Mellet in the Dáil this evening, adding that he wants a referendum on repealing the Eighth Amendment. He was speaking as a bill was put forward by Independent TD Mick Wallace to allow for terminations in the case of fatal foetal abnormalities. Harris said Ireland has been a cold and uncaring place in the past for women. Earlier this month, the EU found that Ireland was obliged to provide compensation to Mellet as she was forced to travel abroad to have an abortion. A committee of experts from the UN’s Human Rights Commission also stated that Ireland’s laws on abortion have had a “chilling effect” on healthcare and contributed to “negative experiences”. The decision came following the 2011 case when Mellet was 21 weeks pregnant and was was told her foetus had congenital defects meaning it would die in the womb or shortly after birth. I am very sorry that this is how she was treated. Ireland’s history shows that it has been in the past a cold and uncaring place for women and children and I felt the echoes of that when I read that UN view. However, the Minister said he was opposing the Bill because he believes it to be unconstitutional. “It can never be said that a foetus with a fatal foetal abnormality will not be born to live for a short time, even if that is only to be minutes, to draw a breath and to have a detectable heartbeat. If a foetus has the capacity to be born, it has the protection of the constitution. Any Bill that provides for termination in these circumstances, as this Bill does, would not be constitutional and would also not be medically practicable. The Minister told the Dáil that a citizens assembly will be developed to make recommendations to the Dáil on further constitutional changes, including on the Eighth Amendment of the Constitution as their first topic. I hope that the Citizens Assembly will recommend that those of us who were never asked the question, and indeed everyone else, will be given the opportunity to answer it, after a careful, considerate, respectful and informed debate. Email “Simon Harris has apologised to Amanda Mellet in the Dáil”. Feedback on “Simon Harris has apologised to Amanda Mellet in the Dáil”.